Abstract colorful white customized lens sunglasses are a best buy for all those who are trying hard to sizzle on the party scene with their fashion choices. You can wear this sunglass to all white, black, funky, hippie, retro, discos, and dance parties. It makes a cool gifting favor for beach parties, pool parties and many other fun filled parties. Corporate businesses or individual businesses, which are trying to stir the party spirits in their targeted customers can seek this customized lens sunglass and employ it for gifting. 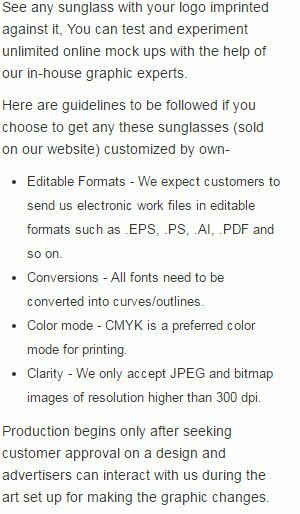 We offer attractive discounts on bulk orders of this sunglass. Highlights - 4 -Color process highlight. Colorful stained lens. White glass frames.